There have been tremendous advancements in recent years in both the variety and quality of care available for seniors in both assisted living and in-home care. Whether in-home senior care or assisted living is appropriate for an older adult depends on the needs of the senior and the most cost-effective way to deliver the services. “You can receive close to the same level of care in your home as you can in an assisted living environment,” said Deni O’Malley, Director of St. Andrews & Bethesda Home Health. “Deciding on whether in-home senior care, home health care or assisted living is most appropriate will depend on the level or degree of care required, individual preference and the financial situation of the person. Typically, seniors who need skilled therapy or nursing support for a short time to get back on their feet – those recovering from surgery or a fall, for example – are candidates for home health care. Home Health Care must be ordered by a physician and is often covered by insurance, including Medicare. A person who has a permanent health condition or requires oversight for medical or safety – such as early dementia or assistance with medication management — that hinders their ability to live independently would more likely benefit from assisted living. Private Pay In-home senior care offers the support that an older adult may need, while giving them the flexibility and comfort of living at home. This senior care option allows for each individual to get just the right amount of help, without paying the steep bill of an assisted living community. For seniors who live independently but need help with a few things – maybe cooking meals, organizing their medicine or help dressing and bathing — staying at home and receiving assistance through private pay in-home senior care option like Bethesda Senior Support Solutions could help them save money as opposed to living 24 hours a day in an assisted living residence. Often Home Health Care and In-Home Senior Care, Bethesda Senior Support Solutions, partner to provide care. Some care covered by Medicare or insurance and some paid out of pocket. The goal is to provide the right amount of care to keep the senior in the environment most appropriate to their needs and in the most cost effective way possible. 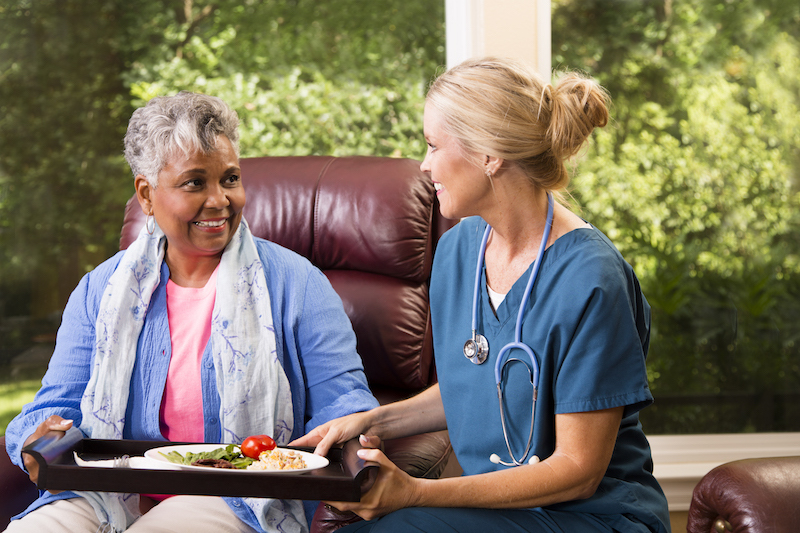 Learn more about Home Health Care and Bethesda Senior Support Solutions. If a senior needs more frequent help on a daily basis, assisted living may be the right option. With medical professionals and doctors in the building, all meals prepared and served, and a wide range of activities, assisted living communities provide great quality of life. Learn more about Bethesda’s Assisted Living Communities in St. Louis. Bethesda offers a wide range of senior living options, as well as senior care and service options, throughout the greater St. Louis area. Our experienced staff can help you determine whether In-Home Senior Care –Senior Support Solutions –Home Health Care, or moving your loved one to an Assisted Living community would be best. Contact us today.